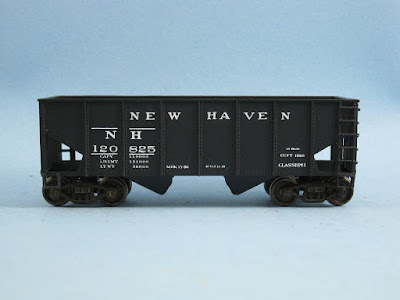 Three "new" hoppers joined the fleet. The first one is a Life-Like 55-ton coal hopper. It used to be lettered Union Pacific and molded in yellow plastic. Black paint and CDS Lettering New Haven decals gave it some dignity. It was from Jérôme's original toy train set from his childhood and now it's back in service. The car details are a little bit coarse, but someone could easily upgrade it with metal wire. For a black car, I feel it isn't required to make the grabirons slimmer because of the optical illusion. For a light-color car, that would be required and then it would be better to acquired a better car than fight with a this one. A good old Accurail or Tichy car would be a good way to go. 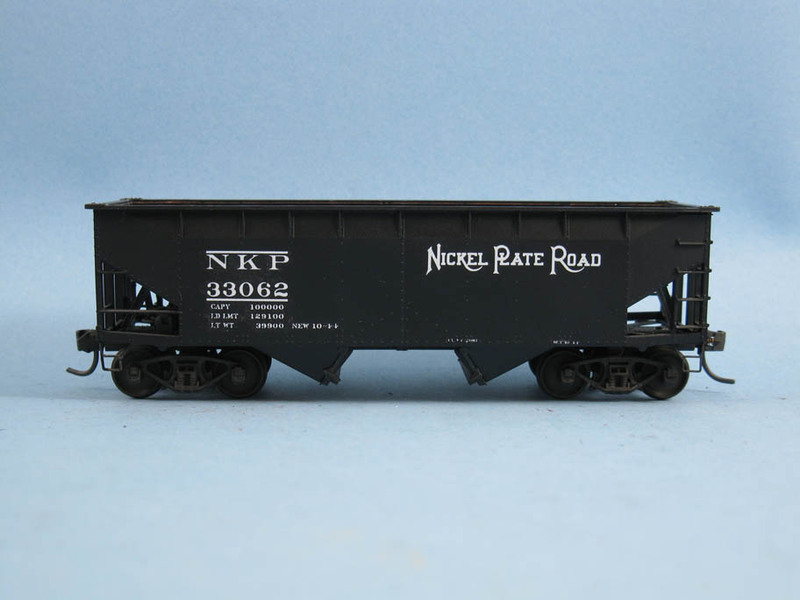 The second one is a black Accurail 2-bay coal hopper lettered to Nickel Plate using, again, CDS Lettering dry transfers. I'm now so accustomed to lettering cars in such fashion I don't miss the tedious process of decalling anymore! The third one was previous presented when under surgery. It is an ex-Penn Central Roundhouse covered hopper. But now, it reverted back to its original paint scheme from the 50s under PRR tenure. I'm seriously thinking about replacing the running boards with Tichy ones because the stock ones are ugly beyond salvation, even with the 3-feet rule! I have many other cars to decal including 4 flat cars. 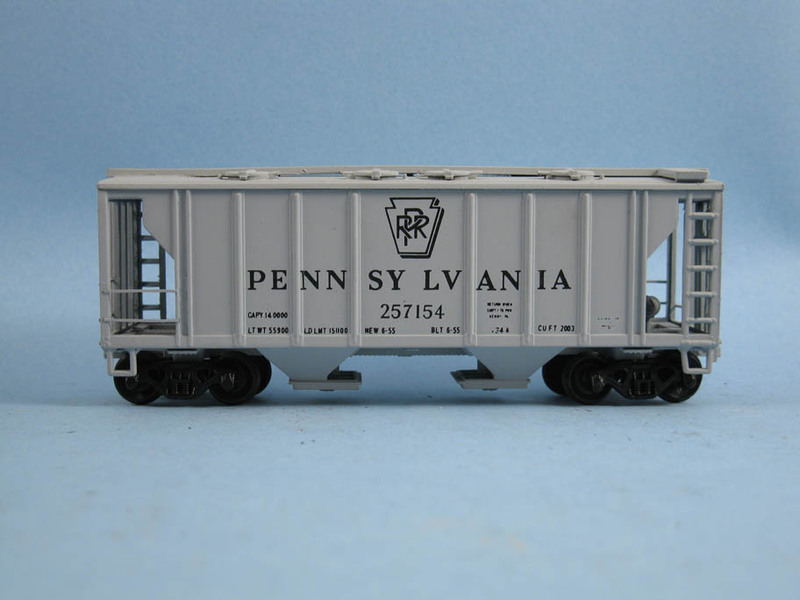 Six other boxcars have been completed too including paint schemes such as Erie, Nickel Plate, Baltimore and Ohio and Pittsburg and Lake Erie. They will be presented in an upcoming post. Meanwhile, the weathering process is still halted because the Dullcote shortage at ULHS (Useless Local Hobby Shop) isn't yet addressed. By the way, after lettering about 20 cars, I discovered black dry transfer are far easier to rub in than white ones. It seems the "paint" isn't the same. Also, very thin letters with serif are harder to transfer than bolder one or ones without serif.